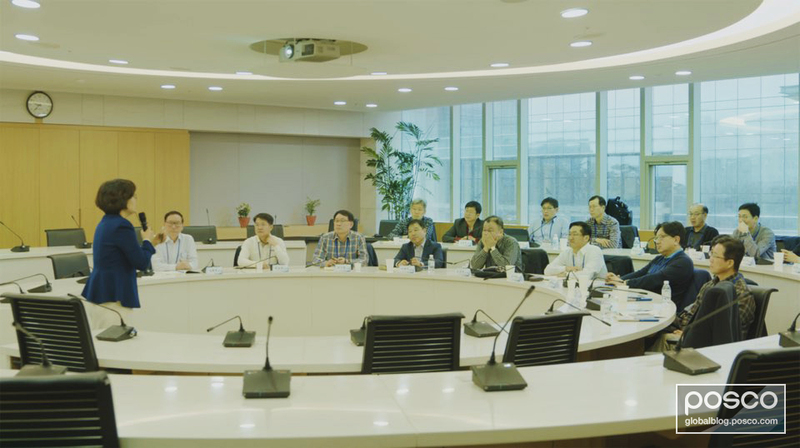 For two days from March 14, POSCO Group University provided education on AI and new steel products for 17 executives working overseas, including presidents of overseas subsidiaries, general managers and heads of overseas offices. The purpose of this program was to enhance their understanding of artificial intelligence and new steel products in order to improve the competitiveness of overseas subsidiaries by spreading POSCO Smart Solutions. At first, in the lecture about ‘Smart Technology and Business Model Innovation,’ they learned about the influence of smart technologies, such as the 4th Industrial Revolution, big data and artificial intelligence, on business models, and in the lecture about ‘Big Data and Cases that Can Be Utilized in Manufacturing,’ they reinforced their understanding of big data modeling. Also, they learned about Smart POSCO, such as the concept of POSCO Smart Solutions, key activities, CES 2018 and smart factory success stories, creating an opportunity to spread it to overseas subsidiaries. In addition, they gained knowledge of new steel products such as POSCO Magnesium Alloy Coating Product (PosMAC), thick plate product (high manganese steel), automotive steel (giga steel) and electrical steel (Hyper NO), and shared relevant cases to expand solution marketing in overseas markets. POSCO ICT Head of the New Business Development Team Mi-hwa Park during POSCO Smart Solution and CES 2018 at Songdo Convention Center. Meanwhile, POSCO Group University is planning to provide education on Industrial Revolution 4.0 and POSCO Smart Solutions for new local leaders and general managers to disseminate the necessity of Smartization.